Marquee games in Southern California and a big-time showdown in the DMV lead this week's action. No. 5 Mater Dei looks to rebound against JSerra Catholic, the newest Top 25 team. The Golden State leads this week's action with three featured games featured starting with Calabasas (Calif.) hosting No. 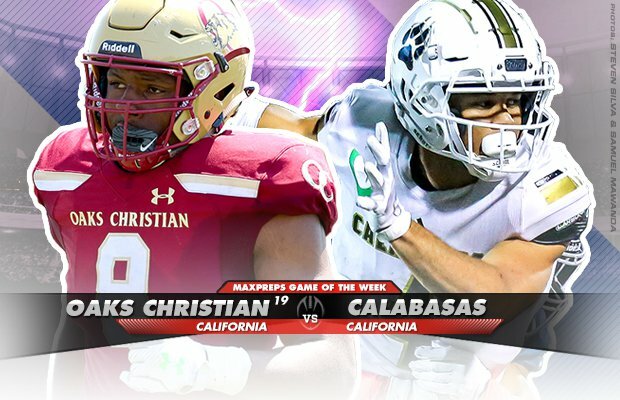 19 Oaks Christian (Westlake Village, Calif.) in our Game of the Week featuring the No. 1 player from the Class of 2019 — Kayvon Thibodeaux. No. 5 Mater Dei (Santa Ana, Calif.) looks to bounce back after suffering its first loss on the field since 2016 against No. 23 JSerra Catholic (San Juan Capistrano, Calif.) and Pittsburg (Calif.) looks to hand Liberty (Brentwood, Calif.) its first loss of the season in a huge Bay Area clash. DeMatha (Hyattsville, Md.) looks to extend its winning streak to six against WCAC rival Our Lady of Good Counsel (Olney, Md.). A big-time 7A showdown in Alabama is going down between Mountain Brook (Birmingham, Ala.) and Thompson (Alabaster, Ala.). Cass Tech (Detroit) is trying to finish the regular season undefeated and the only thing standing in their way is King (Detroit) in a big-time Detroit rivalry game. Colerain (Cincinnati) has dominated the Greater Miami Conference. The Cardinals have won 73 straight GMC games and if they can extend it to 74 against Fairfield (Ohio) they will win at least a share of the conference title. No. 12 Carol City (Miami) has been as dominant as any team in high school football this year. The Chiefs are scoring over 40 points per game and allowing less than 5 points. They take on a very young and talented Booker T. Washington (Miami) team with a big-time matchup against No. 4 Miami Central looming next week. The final two games feature Texas and Arizona. No. 17 Duncanville (Texas) takes on Pearce (Ricahrdson, Texas) in a huge district showdown and two of the best quarterbacks square off when Pinnacle (Phoenix) takes on Chaparral (Scottsdale, Ariz.). Fox Sports West selected this as the Game of the Week for a reason. There' s been a lot of hype between this one for quite some time and Calabasas is looking to hand Oaks Christian its first loss of the season. This contest is loaded with FBS talent, led by Thibodeaux, the top-rated player from the Class of 2019. This will be the first matchup between the two since 2013 and Oaks Christian has won all four meetings over the last eight years. The Trinity League is the SEC of high school football for a reason. A week after Mater Dei lost to No. 1 St. John Bosco, the Monarchs have to regroup and take on No. 23 JSerra Catholic on the road. The Lions played Bosco tougher than anyone this season, losing by seven points. They get another crack at a Top 5 team on Friday night, but expect coach Bruce Rollinson to have his Mater Dei guys ready to roll after behind held to their lowest point total since 2014 last week. No. 3 St. John's is the only team that is 2-0 in WCAC play so far. DeMatha is the only team left that can join the Cadets, but they have to get by a very talented Good Counsel squad first. The Stags have reeled off five straight wins since dropping their season opener against No. 13 St. Thomas Aquinas (Fort Lauderdale, Fla.). Good Counsel's two losses have come against Top 25 teams and the Falcons look to bounce back this week after losing to the Cadets on ESPN2. 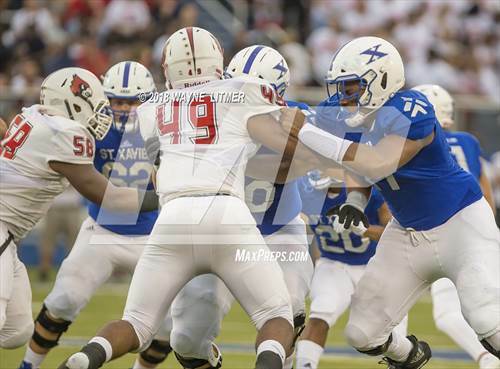 DeMatha is currently one of the first five teams out of the rankings and with a win over Good Counsel will likely have a chance to jump in next week with a matchup against St. John's looming. This is a huge matchup in the 7A-Region 3 league. Both squads are in a four-team race for the region crown. Mountain Brook controls its own destiny after beating Hewitt-Trussville last week but things don't get any easier with matchups against Thompson and Hoover the next two weeks. This is one of the best rivalries in high school football. This will be the 18th meeting between the two since 2004 and King has won nine of the previous 17 including a 17-7 win last year. Cass Tech is looking to finish the season undefeated heading into the playoffs and King's only loss came against Muskegon (Mich.) back in late August by a field goal. Both teams have already clinched their league title. 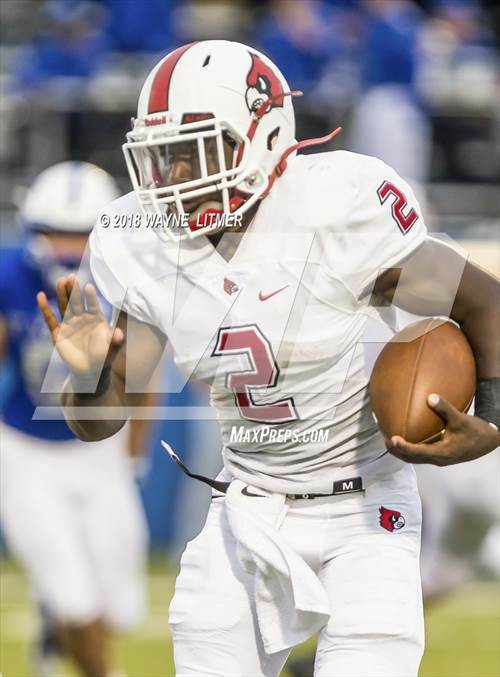 Colerain has dominated the Greater Miami Conference. The Cardinals have won 18 consecutive conference titles and with a win on Friday would make it 19 straight. They have also won 73 in a row in the GMC. Colerain is the first team out of the Top 25 so it is a win or two away from jumping into the rankings. The Ohio Division-I state title is one of the hardest playoff brackets in the country and Colerain has as good of a chance as anyone to win it in 2018. Carol City has been as dominant as any other team in high school football this year, outscoring the opposition 306-30 through its first seven games. Richardson gets to face his old team on Thursday night and he helped lead Booker T. Washington to a state title during his freshman season. There's a chance he could come full circle at Carol City and lead them to a state championship during his senior campaign. The Chiefs have a big-time matchup next week against No. 4 Miami Central so they better not overlook a very good and young Tornadoes squad. Liberty is a team to keep its eye on this year and a win over Pittsburg would put them on the map for sure. 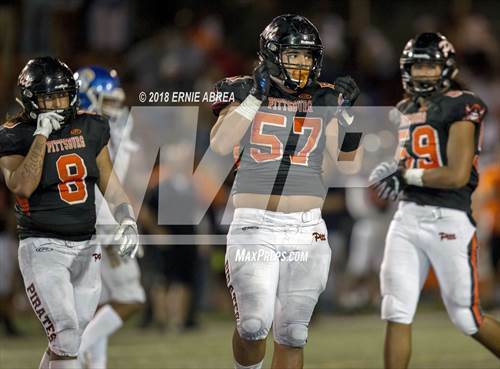 The Lions are 8-0 this season and have one of the best duos in the country with Butterfield under center and Vaki making plays all over the field. 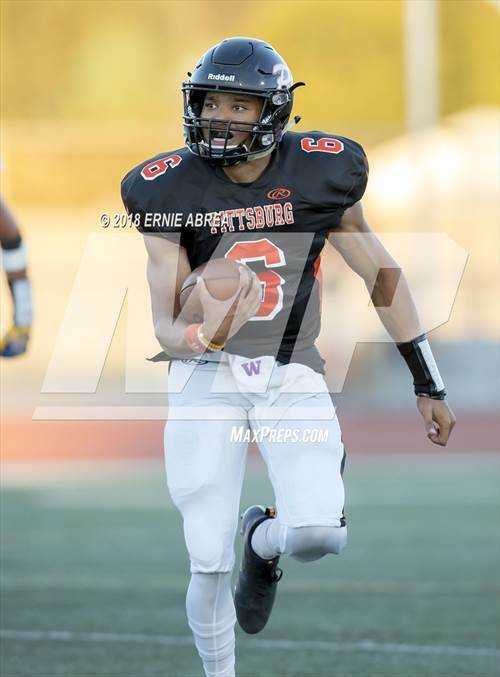 Pittsburg is playing its best football of the season after a 35-7 loss to No. 8 Centennial (Corona, Calif.) back in late August. They have won five in a row and have outscored the opposition 267-76 during that span. This is a huge game in the Bay Valley league with the winner clinching at least a share of the title. Duncanville has been as dominate as anyone in the country this year. The Panthers are allowing less than four points per game and have yet to be in a competitive game this season. They are loaded with talent and it all starts with their 4-star quarterback Jackson. Pearce averages over 40 points per game and the Mustangs face the toughest defense by far on Friday. The winner of this game controls their own destiny to win the 6A-Region 1 District 8 title. Two of the top quarterbacks will face off in what should be a high scoring game on Friday night. Pinnacle's Rattler is the No. 1 rated gunslinger from the Class of 2019 and the future Oklahoma Sooner broke the all-time career record for passing yards in state history a few weeks ago. Chaparral's Miller is a Top 5 quarterback from the Class of 2020 and the future Ohio State Buckeye has thrown for nearly 2,500 yards and 27 touchdowns in 2018.